One blog I read pretty much every day is Exuberant Color. 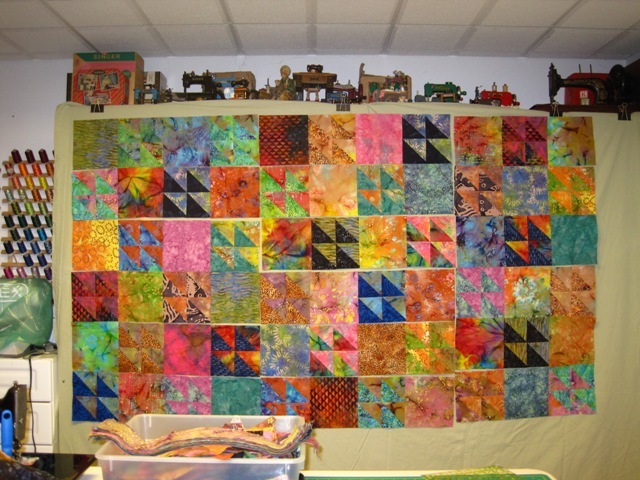 Wanda inspires me with the sheer volume of quilts she makes. Amazing! She is fearless with color and often uses batiks. I had a small stash of batiks but really haven’t used them much. She has inspired me to use up this portion of my stash. I mostly had fat quarters. So I pressed them and layered then and started cutting. My design wall is small so I hung up a flannel sheet. This will end up a twin size coverlet. I have some other bits and pieces to use but they are all cut into uniform sizes. I will probably buy a couple half yard pieces to use in a scrappy border as I only have small pieces left. I like that in some places there is high contrast and in other places everything blends together like a watercolor quilt. My youngest daughter wants this when it is done…..we’ll see! It does feel good to have cleared out a portion of my stash that has been sitting unused for a long time. 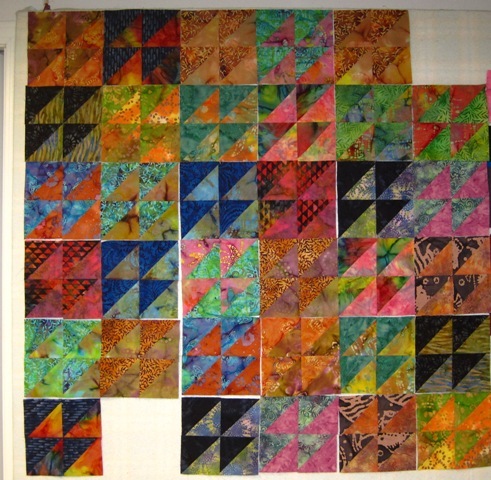 This entry was posted in Bed Quilts, Fresh Modern Quilts, Stash Management. Bookmark the permalink. I love those bright colours. Have you considered binding it without adding a border? I think that might look just terrific with a single colour binding and no border. Will be interested to see what you come up with. Nice work and good on you for putting your stash to such good use.